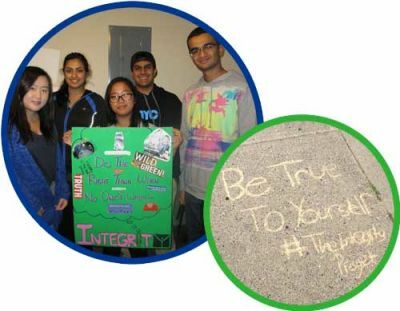 The Abbotsford Youth Commission is a proud champion of Character Abbotsford. Over the last several years we have delivered three separate year-long projects to encourage the attributes of service, integrity and courage in the youth with whom we work. Soon we will be launching our empathy project. Stay tuned to see how you can get involved in the planning and delivery of this exciting new project! In June 2015 we moved into the third year of our Character Project taking on the attribute of ‘courage’. Our Youth Council provided the inspiration and direction for the CIA - Courage in Action project coming up with the activities and methods for engaging other youth. more than 300 people were positively affected! By the end of the year youth who regularly attend our youth centres were spontaneously coming up with their own service projects and asking for help from the staff to carry them out! Through participation in the project youth have experienced the satisfaction of helping others and it is clear that they have connected with the value of service in such a way that it has become a part of who they are and a part of their culture and experience as they grow into adulthood.